New Book Uses Long-Hidden Communist Sources to Explore a Potential Missed Opportunity for Peace in 1966. The inside story of these murky diplomatic machinations, as well as other revelations concerning the Vietnam War, the Cold War, the Sino-Soviet split, and American politics and journalism in the 1960s, can now be found in Hershberg’s book, published this week by the Stanford University Press and the Woodrow Wilson Center Press. Marigold: The Lost Chance for Peace in Vietnam. By James G. Hershberg, Stanford University Press/Wilson Center Press, January 2012. Washington, D.C., January 15, 2012 – Casting new light on one of the most controversial and enduring mysteries of the Vietnam War, a new book using evidence from long-hidden communist sources suggests that the U.S. Government missed a major chance to open peace talks with North Vietnam in late 1966, more than eighteen months before the opening of the Paris peace talks and more than six years before the accords that finally ended US direct involvement in the fighting. The revelations contained in Marigold: The Lost Chance for Peace in Vietnam by James G. Hershberg imply that the United States might have escaped its Vietnam predicament with a far lower toll: the secret Polish-Italian peace attempt code-named “Marigold” by U.S. officials culminated at a time when roughly 6,250 Americans had perished, compared to the more than 58,000 who ultimately died in the war. At one point the clandestine diplomacy verged on a breakthrough, with the apparent mutual agreement to hold an unprecedented meeting between US and North Vietnamese ambassadors in Warsaw to confirm Washington’s adherence to a ten-point formula for a settlement. “I thought I had done something worthwhile in my life,” recalled the American ambassador in Saigon at the time, Henry Cabot Lodge, of that moment of seeming success with his diplomatic partners from Poland and Italy. “We had a drink on it.” A date was even tentatively set for the enemy ambassadors to meet: December 6, 1966. But before the encounter could take place, the covert effort was first suspended—due, the Poles said, to the U.S. bombing of Hanoi, the first such strikes around the North Vietnamese capital in more than five months—and then collapsed, for reasons which were disputed in acrimonious private US-Polish exchanges at the time. Before long, those arguments seeped into the press, sparking an internationa! l scandal and leaving behind a convoluted historical mystery—until now. The inside story of these murky diplomatic machinations, as well as other revelations concerning the Vietnam War, the Cold War, the Sino-Soviet split, and American politics and journalism in the 1960s, can now be found in Hershberg’s book, published this week by the Stanford University Press and the Woodrow Wilson Center Press. Challenging the conventional wisdom that both Washington and Hanoi were so dug in at the time that no real chance for peace (or even serious peace talks) then existed, the study utilizes more than a decade of archival research in more than a dozen countries, both communist (and former communist) and Western, as well as interviews with veterans of the events in Poland, Vietnam, Italy, and the United States—including roughly 50 hours of interviews in Warsaw with the key figure in the affair, former Polish diplomat Janusz Lewandowski, who comes in from the cold war to offer his perspective openly and in depth for the first time. First—some context. Between early 1965, when the United States sharply escalated its military involvement in Vietnam, and the spring of 1968, when Washington and Hanoi finally agreed to talk in Paris, hundreds of attempts were made to bring the warring sides to the bargaining table. Some were public, some secret; some by third countries, some by individuals, some by institutions or organizations; some involved letters, some appeals, some “plans” or “points” or “formulas,” some citations of past accords or international laws or conventions; some were purported “peace feelers” or “signals” so subtle—a wink-and-nod or linguistic wrinkle in an otherwise mundane statement, or a barely discernable decrease in certain military activities—that no one really knew whether they even existed or (if sent) were noticed by their intended target; some were derided by Lyndon Johnson and his secretary of state, Dean Rusk, as pipe-dreams spun by eccentric egotists or idealistic schemers who had contracted “Nobel Peace Prize fever”; others were sophisticated, painstakingly-planned diplomatic ventures designed and conducted at the highest levels of statesmanship. But they all had one thing in common: they all failed. And over those three years, as U.S. forces in Vietnam mushroomed from 25,000 to more than half a million and the war crippled the Johnson Presidency and poisoned American politics, the death and destruction ground on ceaselessly, with thousands of Vietnamese and Americans lives lost every month and countless more ruined. Most of the ill-fated negotiating initiatives undertaken during the 1965-1968 period of escalating conflict never had a real chance: the opposing sides simply weren’t seriously prepared to consider peace, or even peace talks, on terms acceptable to the other. (Some were even designed to fail, to impress public opinion and justify subsequent, already planned military escalation.) Rather than risk defeat or humiliation at the bargaining table, powerful factions on both sides preferred to seek military victory—another Dien Bien Phu, the North Vietnamese imagined, recalling the triumph over the French; or, the Americans calculated, pounding the enemy until it swallowed the status quo ante, the division between north and south, as in Korea. In their 1968 book The Secret Search for Peace in Vietnam, David Kraslow and Stuart H. Loory quoted an unidentified “close associate” of President Johnson as saying that they would “never get the inside story” of Marigold. Finally presenting the “inside story”—or as much as the declassified record finally reveals—Marigold: The Lost Chance for Peace corroborates the sentiment of this unnamed source (which the book identifies as Bill Moyers, LBJ’s protégé and former press secretary, who had recently left the White House), but also concludes that blame for Marigold’s failure was shared, the consequence of misjudgments and errors by all three key participants: the U.S., Polish, and North Vietnamese governments. At the heart of the affair was a cold war anomaly. Not a single communist government recognized the Republic of Vietnam (South Vietnam), instead locating their embassies in Hanoi, the capital of the Democratic Republic of Vietnam (North Vietnam), and maintaining fraternal interparty relations with the ruling Vietnamese Workers’ Party, or Lao Dong. Yet, there was a communist diplomat of ambassadorial rank based in Saigon throughout the war due to the presence of the International Control Commission (ICC) established by the 1954 Geneva Accords that ended the post-World War II conflict between colonial France and the communist/nationalist Viet Minh forces led by Ho Chi Minh. The East-West pact reached at Geneva split Vietnam at the 17th parallel, supposedly temporarily, pending elections to unify the country within two years, but the voting never took place and the division congealed into two rival regimes, the communist DRV in the north and the anti-communist RVN in the south, now backed by the Americans, who had replaced the French. Yet, even though the Geneva Accords were essentially dead by the end of the 1950s, no one wanted to pull the plug on the group set up to monitor both sides’ compliance with them: the ICC (formally known as the International Committee for Control and Supervision). As a cold war compromise, the ICC’s membership was delicately balanced between East and West, consisting of Poland, Canada, and neutral India as chair; as a result, the group unsurprisingly soon found itself stalemated, paralyzed, and ineffectual, but it continued to meet regularly even as the war escalated—and for logistical reasons was headquartered in Saigon, resulting in the incongruous presence of senior Polish diplomats and hundreds of Polish soldiers stationed in a capital of a country run by a strongly anticommunist regime which Poland, like all communist countries, virulently denounced as an American puppet and whose overthrow it militantly supported. Representing Warsaw during the Marigold affair was a young diplomat (then 35 years old) named Janusz Lewandowski, who was based in Saigon, where he would routinely meet US and even South Vietnamese officials, but periodically shuttled (via neutral Phnom Penh in Cambodia and Vientiane in Laos) to Hanoi, where he became “comrade” Lewandowski and saw North Vietnamese leaders like Premier Pham Van Dong, Defense Minister Vo Nguyen Giap, and revolutionary icon Ho Chi Minh. Lewandowski, who arrived in Saigon as Poland’s ICC commissioner in April 1966, was thus ideally poised to serve as a secret intermediary between Washington and Hanoi—which of course lacked normal relations or (except for a few rare, mostly formalistic instances) direct diplomatic contacts—and that is the role he assumed during Marigold. (Interviewed in Warsaw, Lewandowski recalled that shortly before he left Warsaw for Saigon, Polish Foreign Minister Adam Rapacki gave him a secret charter to pursue peace possibilities outside his normal work with the ICC.) His enthusiastic collaborator and co-conspirator was Italy’s ambassador to South Vietnam, Giovanni D’Orlandi, who, in line with the desires of his foreign minister, Amintore Fanfani, and his own passionate interest in the Vietnamese, ardently desired to promote peace. The Marigold channel first sprang to life in late June 1966, when after a recent trip to Hanoi Lewandowski spoke with D’Orlandi and, the Italian excitedly told Henry Cabot Lodge, delivered a “very specific peace offer” from the North Vietnamese. Hopes in Washington that the channel might yield a breakthrough briefly surged in Washington—LBJ told an associate during a tape-recorded telephone conversation that “yesterday I had the most realistic, the most convincing, the most persuasive peace feeler I’ve had since I’ve been President”—but the contacts fizzled as abruptly, and mysteriously, as they had begun. The one positive result of this initial flurry of diplomacy involving the three Saigon diplomats was that the North Vietnamese, despite harshly condemning the latest U.S. military actions, did not reveal the Marigold channel, preserving it for potential future use. After several months of desultory conversation amid further military escalation in the autumn of 1966, the Marigold channel revived for a second act in November and December. The most bitterly contested aspect of the Marigold story has been whether the Poles were actually authorized by Hanoi to set up the direct meeting between U.S. and North Vietnamese ambassadors in Warsaw to confirm Washington’s adherence to the positions which Lodge had relayed to Lewandowski in mid-November in Saigon, and which Lewandowski, in turn, had conveyed to DRV authorities during his subsequent trip to Hanoi. Of course, the Poles insisted that they were acting with the full authorization of the North Vietnamese government, but once the initiative collapsed, top U.S. officials did their best to seed doubt on this score. They hinted or even explicitly claimed that the Poles (or even Lewandowski personally) had acted independently, or perhaps at Soviet instigation, hoping to lure the Americans into a bombing halt or other military concessions, and/or to show their negotiating cards and bottom line for a settlement—all to benefit their North Vietnamese comrades’ quest for victory on the battlefield, rather than to promote peace. After all, the Americans noted correctly, they had had no direct communications from the North Vietnamese, only with the Poles. Feeling on the defensive after the Washington Post first disclosed the clandestine contacts in early February 1967 with an implication that—in the words of a prominently-quoted, unidentified pro-American diplomat at the United Nations (actually the Danish ambassador)—Washington had “bungled” a genuine chance for peace, U.S. officials used increasingly harsh language to question Warsaw’s motives and sincerity. In conversations both with foreign diplomats and with reporters, and later in oral history interviews and memoirs, they used words like “fraud” or “sham” or “phony” to describe the Polish initiative. In May 1967, the New York Times ran on its front page an expose of the affair, written by an Associated Press correspondent and informed by background leaks from Dean Rusk and other senior officials, broadly suggesting that Warsaw had never received Hanoi’s okay to set up a direct US-DRV meeting—an article that caused satisfaction in the State Department and outrage among Polish foreign ministry leaders, who felt that their integrity had been questioned. In his 1971 memoir The Vantage Point: Perspectives of the Presidency, 1963-1969, Lyndon B. Johnson wearily consigned the entire affair to the realm of academic investigators, asserting that it comprised far more shadow than substance: Unlike Rusk, Johnson was too polite to call the Poles “crooks”—as the secretary of state described their actions in Marigold to Averell Harriman—but his disdain shone through just the same. Brushing aside charges that he had squandered chances for peace, he stressed that Washington “never received through the Marigold exchanges anything that could be considered an authoritative statement direct from the North Vietnamese.” He termed the channel a “dry creek” that was exposed as fraudulent when the DRV ambassador failed to show up for the 6 December 1966 meeting in Warsaw. “The simple truth, I was convinced, was that the North Vietnamese were not ready to talk to us. The Poles had not only put the cart before the horse, when the time of reckoning came, they had no horse.” Johnson’s national security adviser, Walt Rostow, declared that the Poles “never had Hanoi sewed up” and his National Security Council staff aides scoffed that Warsaw “just had absolutely no charter from Hanoi to represent them” or was even acting out a disinformation script manufactured in Moscow by the KGB. Nearly two decades later, Dean Rusk still fumed at what he believed had been a Polish scam to snooker him and the United States into falsely believing that Warsaw had acted with a firm mandate from Hanoi. Declaring that he had “doubted the authenticity of Marigold” all along, the former secretary of state called Lewandowski’s position “specious,” since he “simply didn’t reflect Hanoi’s views,” and-citing an assertion by a Hungarian defector-called the ICC commissioner “a Polish intelligence agent acting on his own” (a canard the new book conclusively refutes) and the entire Marigold initiative a “sham.” Brushing off arguments that the bombings near Hanoi had ruined a promising approach, Rusk insisted that “there was nothing to collapse” in the first place. Was Warsaw in fact authorized by Hanoi to arrange the U.S-North Vietnamese meeting to confirm that the “ten points” represented Washington’s policy? That was the heart of the Marigold mystery, and it can now be resolved. The documents below describe the process of secret communist consultation in November 1966, hidden to U.S. officials at the time, that produced an authoritative North Vietnamese consent to the direct contact with an American representative in Warsaw and a politically significant promise to adopt a positive attitude towards talks with Washington should it genuinely confirm the stands that Lewandowski reported Lodge as having stated in Saigon. 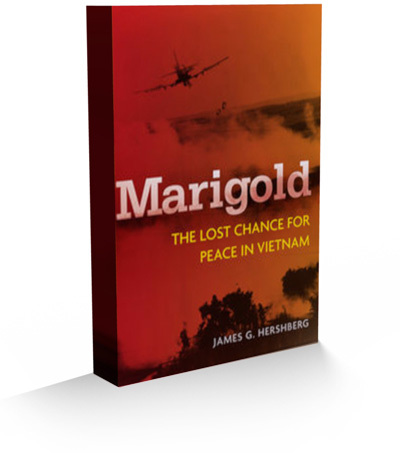 James G. Hershberg, Marigold: The Lost Chance for Peace in Vietnam (Washington, DC: Stanford University Press/Wilson Center Press, 2012). Notes of interview with Henry Cabot Lodge, 12 October 1967, Interviews folder, box 15, Stuart H. Loory papers, American Heritage Center, Laramie, Wyoming. In this regard, see the account of Lyndon Johnson’s 37-day bombing pause, from Christmas Eve 1965 through the end of January 1966, in Hershberg, Marigold, prologue. George C. Herring, ed., The Secret Diplomacy of the Vietnam War: The Negotiating Volumes of the Pentagon Papers (Austin, TX: University of Texas Press, 1983), pp. xxiv, 211-2; Herring, LBJ and Vietnam: A Different Kind of War (Austin, TX: University of Texas Press, 1994), pp. 104-6. Kraslow and Loory, The Secret Search for Peace in Vietnam, p. 54. Hershberg, Marigold, p. 627, citing notes “from bill moyers source M,” “about July or August” 1967, Interviews folder, box 15, Loory papers. On this conflict, see especially the forthcoming book by Fredrik Logevall, Twilight War: The Fall of an Empire and the Making of America’s Vietnam (New York: Random House, 2012). Janusz Lewandowski interviews, Warsaw, June 2003. Tape-recorded Johnson telephone conversation with Federal Reserve Board chair William Martin, 9 a.m., 30 June 1966, in U.S. Department of State, Foreign Relations of the United States, 1964-1968, Vol. IV: Vietnam, 1966 (Washington, DC: Government Printing Office, 1998), p. 473. See Hershberg, Marigold chap. 13. Paul Gore-Booth to Thomas Brimelow, 20 Mar 1967, FCO 15/646, The [British] National Archives (formerly the Public Record Office), Kew Gardens, England. D.F. Murray, “Vietnam: The Lewandowski Affair,” 14 April 1967, in ibid. Rusk quoted in Harriman memorandum of conversation with Anatoly Dobrynin, 27 December 1967, box FCL-8, W. Averell Harriman papers, Library of Congress. Lyndon B. Johnson, The Vantage Point: Perspectives of the Presidency 1963-1969 (citations from paperback edition, New York: Popular Library, 1971), pp. 251-2. Walt W. Rostow oral history interview-I, 21 March 1969, pp. 49-50, Lyndon B. Johnson Presidential Library (LBJL), Austin, Texas. William Jorden oral history interview-I, 22 March 1969, p. 30, LBJL. John P. Roche oral history interview, 16 Jul 1970, pp. 69-70, LBJL. Dean Rusk, As I Saw It, edited by Daniel S. Papp (New York: W.W. Norton, 1990), pp. 467-8. See Herring, ed., The Secret Diplomacy of the Vietnam War, pp. 217, 220. Mario Sica, an Italian diplomat who worked with D’Orlandi in Saigon published an Italian-language study of Marigold in 1991, based largely on declassified U.S. sources because he was not permitted to use still-classified Italian cables (many of which he had encoded or decoded himself) and because Polish and other communist sources were not yet available. See Mario Sica, Marigold non fiorì: Il contributo italiano alla pace in Vietnam (Florence: Ponte alle Grazie, 1991). David Kraslow and Stuart H. Loory, The Secret Search for Peace in Vietnam (New York: Random House, 1968), p. 240. Wallace J. Thies, When Governments Collide: Coercion and Diplomacy in the Vietnam Conflict, 1964-1968 (Berkeley, CA: University of California Press, 1980), p. 341. Herring in The Secret Diplomacy of the Vietnam War, p. 213. Deptels 83786 to Saigon, 13 November 1966, and 84238 to Saigon, 14 November 1966, in FRUS, 1964-68, 4:838-9, 843-5. See Herring, ed., The Secret Diplomacy of the Vietnam War, pp. 263-70; and Saigon telegram 10856, 14 November 1966, in FRUS, 1964-68, 4: 839-41. Translator’s note: the text in red has been crossed out in the original. The Secret Diplomacy of the Vietnam War: The Secret Diplomacy of the Pentagon Papers, pp. 270-271. The references are to Lewandowski’s cables describing the November 14-15 conversations with Lodge, reproduced above. Most likely a less official form than an aide memoire-trans. Lewandowski interview, Warsaw, June 2003. See Luu Van Loi and Nguyen Anh Vu, Tiep xuc bi mat Viet Nam-Hoa Ky truoc Hoi nghi Pa-ri [Secret Interactions between Vietnam-US Before Paris Negotiations] (Ha Noi: Vien Quan He Quoc Te [Institute of International Relations], 1990), pp. 166-7; in the 2002 edition, the authors cite (p. 160) the notes of Nguyen Tu Huyen, chief of the foreign ministry’s translation office (translations courtesy of Lien-Hang T. Nguyen and Merle L. Pribbenow II)..
 D’Orlandi, Diario Vietnamita, 1962-1968, p. 710 (27 November 1966 entry); translation by Isella O’Rourke. See Saigon embtel 12247, 1 December 1966, FRUS, 1964-68, 4:890-4.